I am excited! For the first time in over a year, I get to jump on a plane with my beautiful husband. Yes, one of the days we are working, but we also get a few days away together. For those of you worried about it, our dear friend Eric is cat sitting, so even that detail is taken care of. Still, being vegan, it can be a bit nerve wracking to head to the airport where you may or may not find much to eat. Don’t get me wrong – things are much better for we vegans than they used to be. Six years ago, I was traveling every few months, and I couldn’t find much. A Lara bar or Luna bar would often be what I had for the trip. I didn’t even have Trader Joes! It was sad. Now, there are many more options. Jason, who travels all the time, both nationally and internationally always finds something, and sometimes those things are amazing. In Chicago he discovered that Frontera has vegan tortas! He brought me one last trip and they were good, but not as good as the ones he makes. That is part of my issue. I am a vegan food snob. I not only want it, I want it to be done well. Do not give me a green salad with two pieces of iceburg and a few grayish carrot shreds and tell me to be nourished from it. I will tell you something in return, and it will not be pretty. Part of my answer is just to take a few packaged foods that I love and know are airline friendly. I also take fruit. 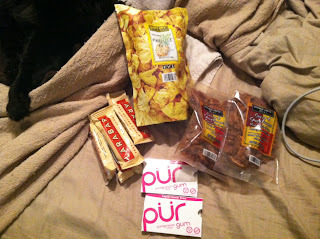 Tomorrow I am taking Lara bars, nuts, cherries, some tempeh bacon, and pineapple chips. Yes, I will only be trapped in airport hell for a total of 5 hours, but I will also have some munchies for afterward if we can’t get to a proper eating place soon. The gum is essential to keep the ears clear, and give my jaw something to do while I work on reading some of the many books I downloaded on my iPad. Thanks to my food cache, I feel that much more confident traveling. Now, if only I were a little more toned for those annoying scanners….